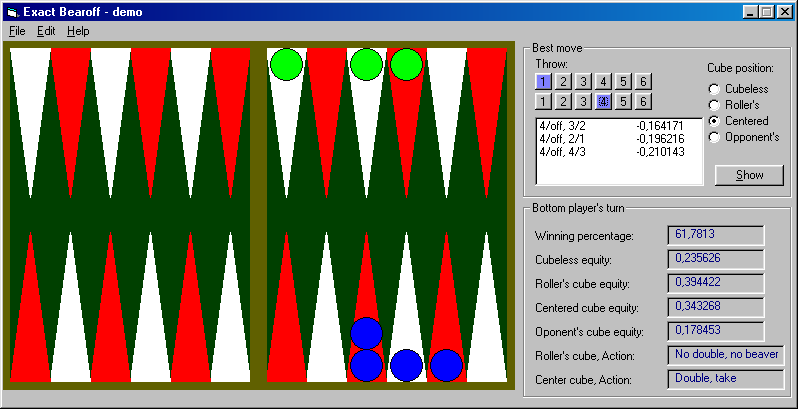 Exact bearoff calculates the winning chances, equity and doubling decisions of bearoff positions in backgammon, for up to about 9 checkers on each side (depending on your computer) or all checkers on the first four points. The program starts by computing all possible bearoff positions for up to a certain number of checkers. This takes a long time, but after that every position will be stored on hard-disk and can be used for instantaneous lookup. Useage of this program is your own risc. MDG Software is in no way responsible for the use of this software. MDG Software does not garantee the correct working of the program. Exact Bearoff is copyright 1999, 2000, MDG Software and is distributed under the GNU Public License.